I recently received the new Keurig 2.0 machine and I have been so excited with it**. My biggest gripe with the old Keurig system was that for heavy coffee drinkers (like me) the 1 cup at a time brewing just wasn’t enough. This new machine not only brews individual cups, but it also brews full carafes which is perfect for when I want to make a large pot of coffee and then chill it to drink iced over the course of the day. Of course, the Keurig 2.0 is still great for brewing individual cups of coffee and I do use it for hot coffee throughout the day. But that leaves me with another gripe about the Keurig. The amount of WASTE the K-cups generate. Compared to a standard drip brewer with grounds and a single filter, the little K-cups create a ton of non-recylcleble trash.. and this hasn’t gone unnoticed by environmental activists. I love my Keurig coffee, and I love my K-cups.. but I don’t love the guilt. So I have been saving and washing my used polystyrene K-cups with hopes of creating a project out of them, and this fall I finally collected up enough to make a great little garland for Halloween. The whole thing cost me a total of $1. Yes. I bought the string of lights at the dollar store, and the K-cups were free (obviously.) I used my silhouette to create the faces but you could easily just draw them on in sharpie, like I did on the milk carton Jack O’Lanterns. First I need to give you a quick lesson on how to clean out the K-cups. I cut them open, remove the foil lid, dump the coffee grounds in my gardens and then remove the filter inside. If you compost the coffee filter, that means foil lid becomes the only waste. Much better than throwing away the entire K-cup. 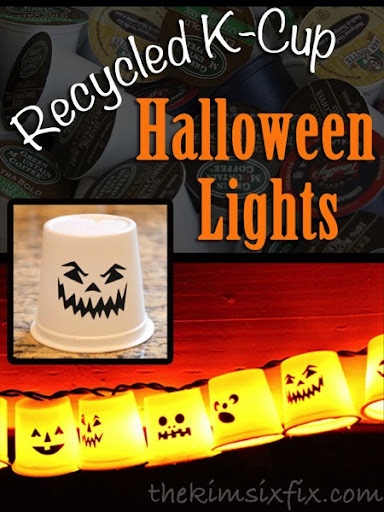 Once you have collected enough K-cups (my strand was 20 lights so I needed 20 cups) you can either draw on them with sharpie or cut out little vinyl faces on the Silhouette. I use clear contact paper to transfer the faces (cheaper than real transfer paper and I like that I can see through it so I know where I’m putting the transfer) These were just some stock jack o’ lantern faces I found online, but you could draw whatever types of faces you like.. either all different or all the same. My string of lights was about 5 feet long, so I hung it underneath my mailbox. During the day the little white cups look like little Ghosts.. They light up the end of the driveway, and so it will be obvious to the trick or treaters that we are “open for business” on Halloween night! And all while saving 20+ K-cups from the landfill. Win-Win! **I was not asked to write this post by Keurig, nor was I compensated in any way. I did receive the brewer for free, but I truly love it and wanted to mention it here.